It’s that time of year and everyone is suffering! Allergies, Colds and the Flu are spreading all over the country. Here’s some info to help you protect your kids, staff and families! When you wake up sneezing, coughing and have that achy, feverish, can’t move a muscle feeling, how do you know whether you have cold symptoms or the flu? Cleaning and disinfecting are part of a broad approach to preventing infectious diseases in schools. To help slow the spread of influenza (flu), the first line of defense is getting vaccinated. Other measures include staying home when sick, covering coughs and sneezes, and washing hands often. Below are tips on how to slow the spread of flu specifically through cleaning and disinfecting. Dust, cats, peanuts, cockroaches. An odd grouping, but one with a common thread — people can be allergic to them. 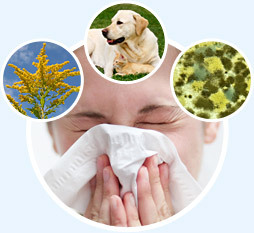 Allergies are a major cause of illness in the United States. Up to 50 million Americans, including millions of kids, have some type of allergy. In fact, allergies lead to about 2 million missed school days each year.